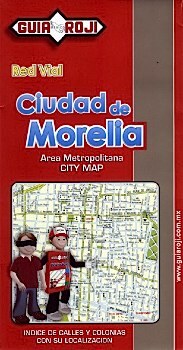 Detailed street map of Morelia. Shows roads from divided highways to minor roads; airports; major buildings, monuments, public facilities, parks, places of interest. With street index; inset maps of city center; regional map on reverse. Main map scale 1:20,000; regional map scale 1:1,000,000. In Spanish.